Last week I ran the Story Story Dance! class with the preschoolers and it went surprisingly well. The class sizes were much smaller than the kindergarten group, which I think just works better, about 10 students. When it got to be that time in the class to start handing out the props that go with "The Little Old Lady Who Was Not Afraid of Anything" by Linda Williams, I handed the props to two students at a time and called them up to do the movements; the rest of the students mirrored their movements from their story squares. Next, I did something I did not do with the other two classes - I took back the props after they were done and lined them up in front of me on the floor in the order they appeared in the story and the students rejoined the group in the half circle. Though I have double of everything, I would put out one of each to go along with the story, and put the second matching prop away. Each time the story reviewed all the clothes and their corresponding movements, I would point to, or pick up the prop, and the students did (and said) the movements from their story squares. This worked great. I was not sure how this was going to work with the little ones, but laying the props out as we went along was really the way to go. And after the story - monster mash dance party! I have been writing a lot about this book and the props because these were my first classes using the book this way. For me, trying something new is kind of exciting because I really have no idea what's going to work, how the children will respond, or if they are going to like it at all. I knew that they would like all the little props, but did not know at the start which way would be the best way to incorporate them. Sometimes the best way to plan for something is not to plan, but to let things happen. That is the approach I took with this. Each class experienced the story and props in a different way, no one cried, no one got hurt, and I think most of the students (who knows maybe all of them) had fun. I have been earning an M.Ed in special education, which I am just a few weeks away of finishing (yay!) and one of my professors turned me on to this website, www.tolerance.org. This is a great site and is one I now refer to pretty regularly. It is full of great resources including lesson plans, publications, children's books, etc. on diversity and respect. I highly suggest checking it out. I was discussing the website with a colleague and we started talking about our feelings about the word "tolerance." Both of us preferred the word "acceptance" to tolerance. Not that tolerance is a bad word, but I think for both of us, we want students in our care to do more than tolerate each other. The message we want to send, and that I think this website hones in on, is acceptance. I don't want my students to just put-up with each other (which is what tolerate means to me). If we are teaching tolerance, what we are really teaching is acceptance - of self and others. Acceptance, to me, is more about welcoming, which I believe is something greater than tolerance. As I write and reflect, I can honestly say there are times when I do tolerate people more than accept them. So, I suppose that is also a skill. What do other teachers say or feel about diversity and tolerance in the classroom? Today I led my first groups integrating the props into The Little Old Lady Who Was Not Afraid of Anything by Linda Williams. My first group was 18 kindergarteners, a pretty big group. After doing our snake breath and warm-up, I passed out the story squares and all the props. I was short two. In an instant, I had to turn this moment into something amazing or else things could turn very badly very quickly. Aha! They are going to start the story. I walked them away from the group of students sitting on their story squares with their props in hand. They would start the story by tagging the students who have the baskets (they were they old ladies). The story opens on a windy day, so my story starters turned into the wind and blew themselves over to the group and tagged the next two students in the story. In the story, the old lady gathers spices and herbs; these students acted this out in the center of the group. Then, they tagged the students with shoes, then those students tagged the students with the shirts, and so on until everyone had a turn. Nobody got upset about not having a prop - phew! This is a moment that could have gone so horribly wrong. "Story Tag" happened as a response to a possible child meltdown that instead became the spark for the rest of the class. The next group to come in was the pre-k and they are a much smaller group. They sat in more of a semi-circle to me which I think works better for using the props. These students came right up on their turns, made their props dance as well as danced themselves, and were visible by everyone and everyone could still see the book. The kindergarteners sat in a circle. Dancing and moving inside the circle got crowded at times, and made the book hard to see for students in the outer circle. None of them seemed to mind, but I will try the semi-circle method with them next time I do props. After we did the story, I ended each class with a monster mash dance party. I played them the old tune by Bobby "Boris" Pickett & the Crypt-Kickers. The best spontaneous thing that happened was when the kindergarteners formed their own conga line and made it go around in a circle. Pretty awesome. I thought that was great. When the pre-k kids attended their monster mash party, they did not make a conga line, but they sure had a lot of great monster moves. I gathered and also made props to accompany my telling of the Little Old Lady Who Was Not Afraid of Anything by Linda Williams. Students will act out the appropriate movements that appear in the story and match the various props. I have doubles of everything that the little old lady encounters so that I can give more students more turns during our short time together - with a few exceptions. I found a pack of six plastic jack-o-lanterns, which also happen to look just like the one in the story. My husband sculpted one pair of shoes using air dry clay; it being a pair, two kids can get a turn at the same time. Missing from the photo is my little scarecrow on a stick that I found at a crafts store for the ending. I may go hunt down a second one, I haven't made up my mind yet. I also have a prop to represent the old lady, two adorable baskets. The top hats are wearable and the gloves are child sized. It is a little hard to tell in the photo, but the shirt sleeves and hems are also fringed like the pants. What can I say, my scarecrows dig fringe. This is one of my favorite books to teach with. I love when authors choose language that invite movement. I want to capitalize on that in my Story Story Dance! classes. The props provide students with another opportunity to connect with language. This class incorporates tactile, kinetic, visual, and auditory learning experiences, which means increased chances of reaching more learners. 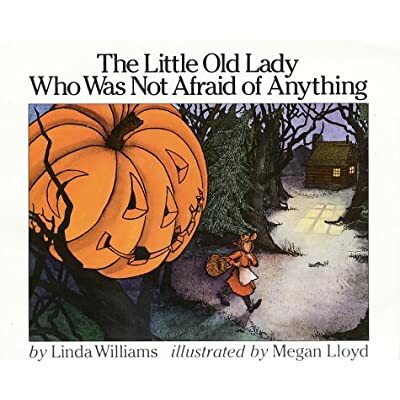 Next week I will be reading one of my favorite books (also listed on my recommendations page), "The Little Old Lady Who Was Not Afraid of Anything" by Linda Williams. I will be sharing the book in my classes next week for Story Story Dance! This will be my first time incorporating props to tell the story. I went on an adventure today to gather up what I need, a process which lit up my creative synapses. I have a plan for incorporating the props, the story, and the dancing, but since this will be the first time doing it this way, it will be exciting to see how this all unfolds. I love the creative process I experience when I am creating my classes. I enjoy the challenge of bringing all the elements together and trying them out, and seeing the kids get excited about participating. That's really the best part.